Today, I’m going to talk about the word “plans”. You may want to note that I’m using the word in the plural. Plural means more than one. For instance, the word “dog” is singular, but “dogs” is plural. 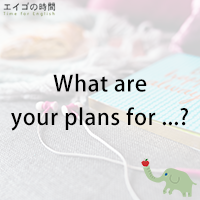 When you talk about what you do with your time, for example, what you’re doing for the weekend or summer vacation, or how to celebrate your mother’s birthday, the word “plan” is used in the plural. Let me give you some example sentences: What are your plans for the weekend? What are your plans for the summer? Do you have any special plans for your mother’s birthday? Do you have plans after this? I have no plans for the future. You can write your own example sentences. Just make sure to use “plans” instead of a “plan”.